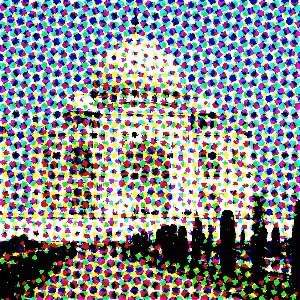 This filter halftones the image using a clustered-dot dither. Halftoning is the process of rendering an image with multiple levels of grey or color (i.e. a continuous tone image) on a device with fewer tones; often a bi-level device such as a printer or typesetter. The basic premise is to trade off resolution for greater apparent tone depth (this is known as spatial dithering). There are many approaches to this, the simplest of which is to throw away the low-order bits of tone information; this is what the posterize filter does. Unfortunately, the results don't look too good. However, no spatial resolution is lost. This filter uses a clustered-dot ordered dither, which reduces the resolution of the image by converting cells into spots which grow or shrink according to the intensity that cell needs to represent. Imagine a grid super-imposed on the original image. The image is divided into cells by the grid - each cell will ultimately hold a single spot made up of multiple output pixels in order to approximate the darkness of the original image in that cell. Obviously, a large cell size results in a heavy loss in resolution! The spots in the cells typically start off as circles, and grow to be diamond shaped. This change in shape is controlled by a Spot function. By using different spot functions, the evolution in the shape of the spots as the cell goes from fully black to fully white may be controlled. You can find this filter through Filters → Distorts → Newsprint…. All your setting changes will appear in the Preview without affecting the image until you click on OK. Note that the preview displays only a part of the whole image if the filter is applied to an selection. Don't keep Preview checked if your computer is too slow. This group controls the cell size, either by setting the input and output resolutions, or directly. 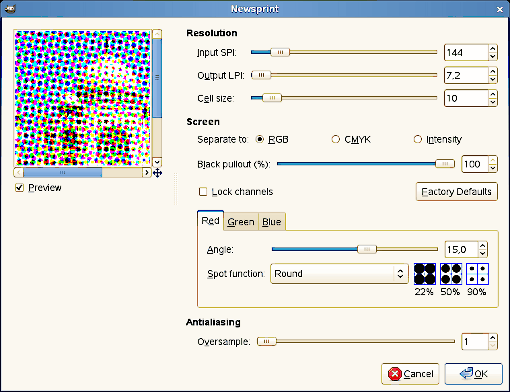 Resolution of the original input image, in Samples Per Inch (SPI). This is automatically initialised to the input image's resolution. Desired output resolution, in Lines Per Inch (LPI). Resulting cell size, in pixels. Most often you will want to set this directly. Select which colorspace you wish to operate in. In RGB mode, no colorspace conversion is performed. In CMYK, the image is first internally converted to CMYK, then each color channel is separately halftoned, before finally being recombined back to an RGB image. In Intensity mode, the image is internally converted to grayscale, halftoned, then the result used as the alpha channel for the input image. This is good for special effects, but requires a little experimentation to achieve best results. Hint: try CMYK if you don't know which to go for initially. When doing RGB->CMYK conversion, how much K (black) should be used? Make channel modifications apply to all channels. Restore the default settings which should give pleasing results. Cell grid angle for this channel. Spot function to be used for this channel (see preview in blue cell-boxes). Proper halftoning does not need antialiasing: the aim is to reduce the color depth after all! However, since this plugin is mainly for special effects, the results are displayed on screen rather than by a black/white printer. So it is often useful to apply a little anti-aliasing to simulate ink smearing on paper. If you do want to print the resulting image then set the antialising to 1 (ie, off). Number of subpixels to sample to produce each output pixel. Set to 1 to disable this feature. Warning: large numbers here will lead to very long filter runtimes!